In the Hoima and Masindi districts of western Uganda, more than 300 wild chimpanzees survive in shrinking fragments of forest on agricultural land. This area has strong conservation value as a ‘corridor’ linking major chimpanzee populations in two large protected areas (Budongo and Bugoma forests, each home to more than 500 chimpanzees). However, the small corridor forests are owned by local village households and have no formal protection. Since the 1990s, these forests have been extensively logged and converted to farmland. Habitat loss has led to escalating levels of conflict between villagers and resident chimpanzees, threatening the survival of this important population of great apes. At one site within the corridor – Bulindi, where chimpanzees are studied for a long-term research project – more than 80% of forest was cleared between 2006 and 2014 alone. During that same period, the community of chimpanzees in Bulindi declined from more than 30 individuals to 19, with at least some of this decline attributable to human actions such as trappings. Despite ongoing conservation activities throughout the corridor region, deforestation has continued apace and conflict remains high. 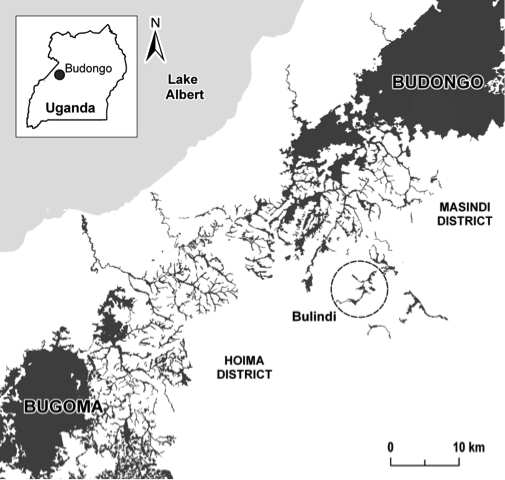 ​Map of the region showing the Budongo and Bugoma Forest Reserves (in Masindi and Hoima Districts, respectively) and the network of small unprotected forests in the intervening ‘corridor’. The project site at Bulindi is encircled. The Bulindi Chimpanzee & Community Project was established in response to this urgent conservation situation. In May 2015 we initiated a pilot project at the Bulindi site. Our immediate goal was to halt on-going deforestation in Bulindi to increase the long-term survival prospects of its resident chimpanzees. Our broader goal was to find a workable template to help conserve the wider population of ‘corridor chimpanzees’ in unprotected forests regionally, which are equally threatened by human activities. Our approach is simple. Since local villagers are poor and clear forest to raise cash (from timber and farming) and for wood (e.g. for cooking), we sponsor schoolchildren to help households meet one of their primary expenses, alongside an extensive tree planting program. We additional support small household projects such as livestock-rearing or house construction. Project participation is voluntary, but participating households must agree to not cut any more forest on their land, and to help us plant new trees.